Hello! Long time, no see. I have been a little bit busy with projects, some family things, and getting ready for school to start. (First day is Thursday!) Thought I would jump on here and share with you all. I was very surprised and happy to be asked to be the Guest Garden Girl over at Two Peas this month. When I got the email, I really thought they had sent it to the wrong person. But, I decided not to ask if they had made a mistake and jumped at the chance! :) The theme for this month is patterned paper. I LOVE to work with patterned paper, so I had an easy time working on my projects. 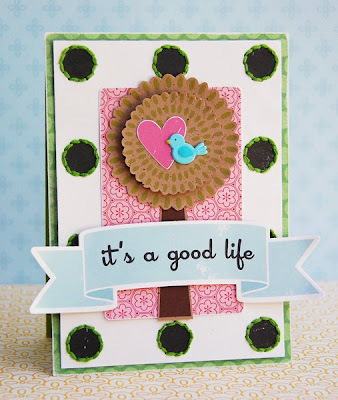 For this it's a good life card, I enhanced the polka dots in the paper with hand stitching. I also cut out the tree and popped it up with foam adhesive for an embellishment with added dimension. 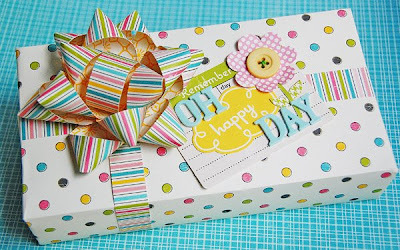 For this oh happy day gift wrap project, I covered a small box with patterned paper and used strips of patterned paper to make the bow. I really loved the way it turned out. A little time consuming, but still very easy to make. For this to grandmother's house we go mini album, I had a lot of fun mixing and matching patterned paper for the cover, but kept the inside simple to put more focus on the photos. For this sweet layout, I used colorful strips to frame the photo of my youngest daughter. I love the punch of color and pattern against the more neutral background. I will have some more GGG projects to share after the 15th, so I will make sure to post them here too. 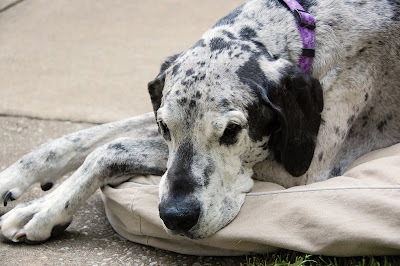 On a bit of a sad note, (I hope you don't mind me sharing) we recently lost one of our beloved pets... our sweet boy, Razzy. He was a big part of our family, and we all have had a hard time with losing him. This is the first real loss that my kids have had to go through, so it has been a little rough. We will always miss him. I appreciate you letting me share (the good news and the bad). Thanks so much for stopping by. Hugs! Big congrats and these projects are truly too cute! You dont give yourself enough credit!! You are AMAZING!!!!!! And you deserve it!!! These adorable creations are wonderful!!! Im so sorry you lost your dog. They are family and its like loosing a member!! oh no, I'm so sorry to hear of your loss of Razzy :( thinking of your girls and your family. congrats on your 2peas gig... that is AWESOME, and your projects are amazing!!!! Roree your projects are amazing....wow that bow is FAB! So sorry to read about Razzy. With 2 dogs of our own I know how special they are and can only imagine the sense of loss you all feel. Take Care! `Congrats` one your Two peas Roree!!! 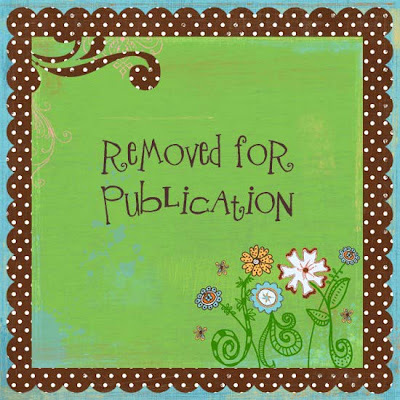 Congratulations on being chosen as GGG at 2Peas! That's awesome!! I love what you made! Roree, these projects are amazing, girl! I'm off to see them over at 2 peas, CONGRATS!! Well deserved! So sorry to hear about your pup. I know it's very hard to lose a member of your family. Hugs! AMAZING projects as always. Your blog is like a treasure of inspiration! I'm so sorry for your loss. He was a cutie. I was so excited to see that you were the GGG over at 2 Peas!!! You so deserve that my dear! Loved all of your projects. So sorry to hear about your puppy though. I am sending lots and lots of hugs for you and your family. Oh Roree!! HUGE huge hugs girl..I am SO sorry. Saying a prayer for you and your family! CONGRATS to you on the GG at 2Peas!! WOW!! So fun...you are so deserving! LOVE your work! Hope you have a wonderful week! Congratulations on the GD spot - your work rocks - no mistake there. Awesome projects! So sorry to hear about your little guy - it's always so hard to loose a pet - such a big spot to fill - HUGS! Awww, I'm so sorry about the loss of your Razzy. What a cutie he was. Losing a pet is so hard...(((hugs)) HUGE congrats on GGG. You so totally deserve it.Your projects are drop dead amazing! Well, I am just now coming to say CONGRATULATIONS!!!!! I was just there and figured it out. Awesome projects!! Always so fun and oh so creative. Sorry about your sweet dog. I still miss mine. I'm sorry about Razzy. Looks like a sweetheart. But lovely to see that you've been sooooo creative!!! Great, beautiful work! OOwww.. I'm so excited to see you popping up as GGG at 2peas!! Sooo well deserved.. totally love your work!! So sorry to hear about your doggie... this must hurt so much. Big hugs to you and your little family! Roree, as always I know that when I bip into your blog I am going to see dazzling things... Love your work. I am so so sorry about your sad loss of Razzy. My dog Heidi is my companion and I love her dearly. Sweet Razzy is in Rainbow's End romping and playing. Just remember that pets become part of the immediate family, so you have to grieve them also. I lost 2 of my precious dogs last year and someone told me "All Dogs go to Heaven". Congrats on your guest spot! All your projects are just amazing, this is definitely the place to go when in need of inspiration! Sorry about your dog, he lookes really sweet. Oh Roree, I'm truly sorry about the loss of your precious Razzy. It is unbearably sad to have say goodbye to such good friends. Your creations are stunning as always. I really love the LO with the strips of paper. Congratulations on your GGG spot. Thinking of you and your family during this tough time. So sorry to hear of your loss. So sad, wish they could live forever. sorry for your loss.